Got an amazing line up of beautiful jewellery pieces all up for grabs in a fun jewellery raffle to raise money for Keep a Girl in School charity! RAFFLE TICKETS / RAFFLE NOW CLOSED! Enjoy the beautiful jewellery feast!! 10. Bright lampwork necklace on 18" gold plated chain with gold ceramic spacers beads by Shahlaa Walsh of All That Sparkles Beads. Thanks for looking! Now go buy your tickets! New Bosom Buddies, Sets, and a Facebook Giveaway!!! Bosom buddies have been a huge hit, especially in October for Breast Cancer awareness month. There are lots of new styles of Bosom Buddies in my Etsy shop for you to look at and £1 from every sale still goes to cancer research UK. This bosom buddy was made with Val Cox frit "Ocelot Spots" and gives this gorgeous mottles appearance of colours. I've also listed a couple of sets in my Etsy too including "Fortnums" which has some gorgeous Val Cox frit called Cherry Blossom. 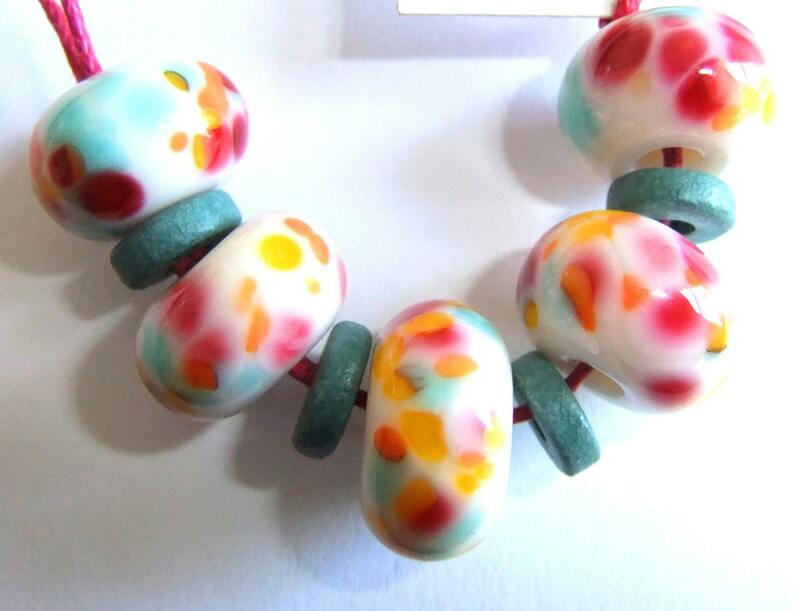 For mailing list members, I'm offering 10% off all beads for the rest of November. All you have to do is email me at shahlaa@hotmail.co.uk requesting to be on the mailing list and I'll refund you your 10% back. As I've been out of action for a while I have a little offer for my mailing list friends! 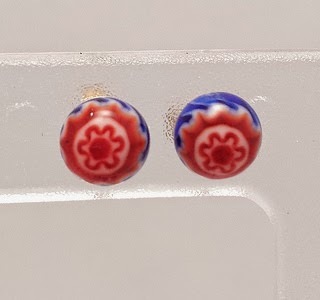 I have an earring pair up for grabs and you can pick between 3 different pairs. All you have to do is be on the mailing list (email me at shahlaa@hotmail.co.uk with mailing list in title) and for a second entry either recommend someone else to be on the mailing list or buy something from my Etsy. If you recommend someone else, you just need them to send me an email with your name on and requesting to receive my newsletter. I will draw on Friday 17th September. Here are the earring pairs on offer! Enjoy! 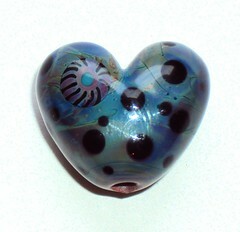 Have listed a few beads and hearts on etsy. Hope you like! Where have I been hiding???!!! 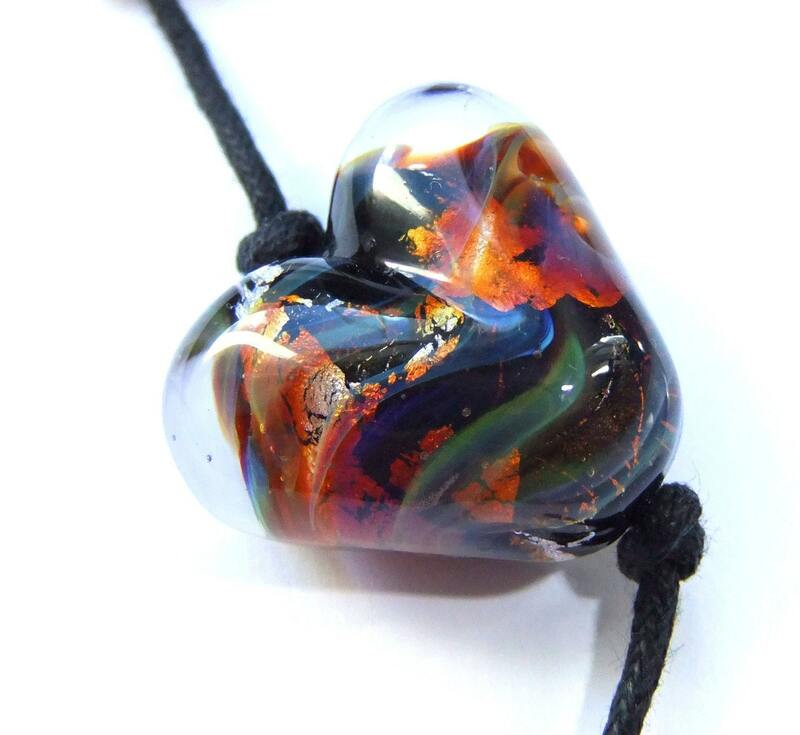 These 2 hearts have been inspired by the Amber Opals tutorial going around. I've also been playing with some of Val Cox's new and old frits. The following are Playdays on unique butter pecan by CiM, and Bea's Bonnett on vetrofond light pink. Hello all! Has been a while hasn't it! Has been a rollercoaster of a few months. On the bright side, in April some friends and I went to the Flame Off, which is a massive lampworking convention at Towcester Racecourse. 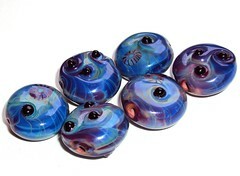 I saw many demos by great artists there and soent time with some great lampwork friends. 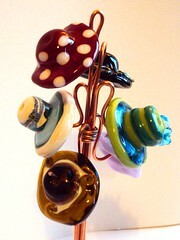 I also won the public vote in the GBUK (glass beadmakers UK) competition for my entry "too many hats, so little time"! Very proud and excited to have been voted for by my own colleagues. I was also commended by one of the judges, Sharon Peters. My entry is below. On a slightly sadder note, I was told a few weeks ago that my father, who has been fighting bowel cancer for 4.5 years, is no longer responding to treatment and now has months to live. I am still trusting God for a miracle but it has been and is a difficult time at present for me and my family. 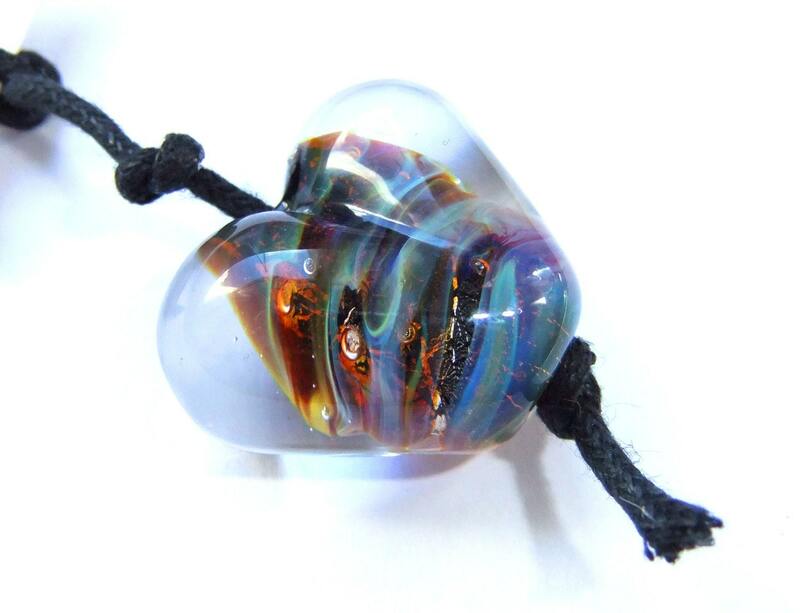 I got some beautiful glass at the flame off so thought I'd share some pics of my new work with you. "Too many hats, so little time"
New beads listed on Etsy & Join my mailing list! 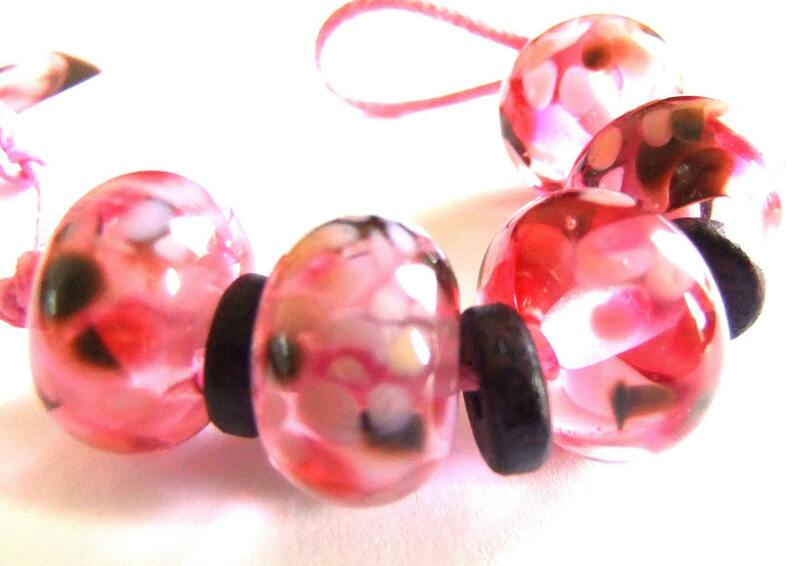 I have just updated my ETSY with some of the beads shown below! So do click and visit! 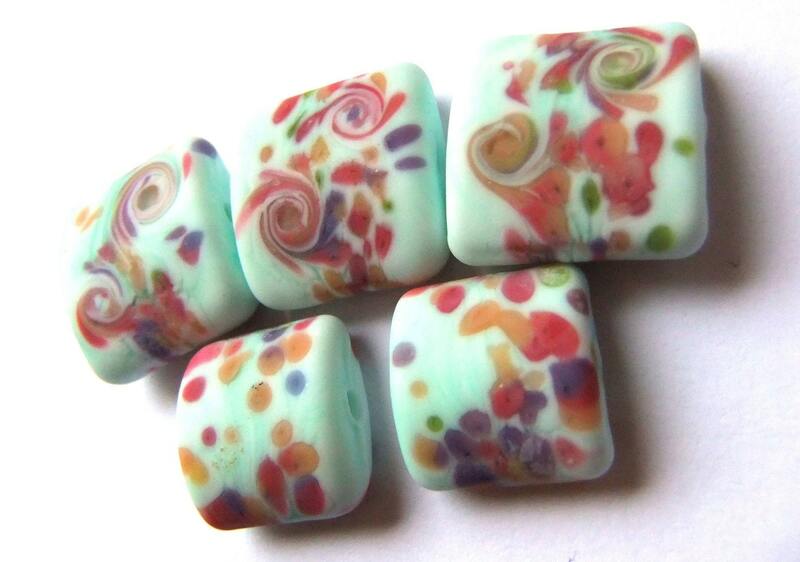 New beads & a preview idea! I'm so sorry i'v not blogged in a while, but unfortunately my camera has been broken and just came back from being repaired. I've had lots of beadies just sitting here waiting to go! Got quite a few beadies for you to see, but before i do i thought i'd share an idea I've been working on. My hubby loves bassetts allsorts so i thought I'dmake some from glass! these are just a prototype and need a little tweaking but i will be taking orders for them in the very near future. Right now here are my latest beadies for you to have a nosy at, some of these will be on etsy in the next couple days. And finally a pointy flower!